1. Place the flour into a large bowl or the bowl of a stand mixer. Add the yeast to one side and the salt to the other. Spoon in the malt extract or honey. Measure 250ml warm water. Add about ¾ of this to the flour and mix, either with a spoon or with the dough hook attachment on the mixer. Add the rest of the water gradually, mixing until a soft dough forms. You might not need all the water, or you might need to add a little more depending how much the flour absorbs. 2. Knead the dough for 5-10 minutes until smooth and elastic, then place into a bowl, cover with a damp tea towel and leave to rise for 1-3 hours. You want the dough to at least double in size. 3. Line a large baking tray that will fit into the fridge with baking parchment. Lightly flour your work surface, then tip the risen dough out and briefly knead it to get rid of any large air pockets. Divide into 12 even pieces, each weighing around 65g. 4. To shape the dough into bagels, first roll into a tight ball by tucking the edges of the dough into the centre. You should have a taut surface. Oil the handle of a wooden spoon and use it to pierce the dough ball in the centre. Make small circular motions with the spoon to widen the hole. When the hole is large enough, turn the ring on its side and place both index fingers inside. Stretch and spin the dough until the hole is the size of a ping-pong ball, then place onto the baking tray. The dough will shrink a little. Repeat with the rest of the bagels. Cover the tray with oiled clingfilm and place into the fridge to rise overnight, or for at least 2 hours. 5. Preheat the oven to 220°C, gas mark 7 and set up a cooling rack over a baking tray. Half fill a large, wide saucepan with water and bring to the boil, then stir in the bicarbonate of soda and malt extract or honey and allow to settle to a gentle simmer. 6. 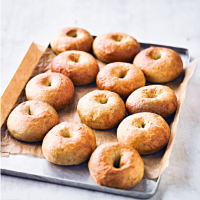 Gently drop the bagels into the simmering water and boil two or three at a time for 60 seconds on each side. They may sink when you drop them in, but should rise to the top as they cook. Remove with a slotted spoon and place onto the cooling rack to drain briefly. 7. Transfer the boiled bagels to the lined baking tray and sprinkle over your desired topping (Everything bagels or Sesame bagels or Cinnamon & raisin bagels), or simply leave plain. Bake for 12-15 minutes, rotating the tray halfway through, until the bagels are a light golden brown. Allow to cool briefly on the tray before snaffling warm, or turning into a sandwich.